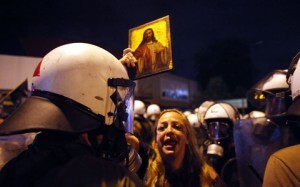 A review of a report on the extent of Golden Dawn’s penetration of the Greek state. An excellent free downloadable report published by the Rosa Luxemburg Foundation is not only an essential primer for understanding the parliamentary rise of the neo-nazi criminal organisation Golden Dawn (GD), but a much-needed corrective to academic fashions that see the far Right as emblematic of extremist tendencies on the margins of society. 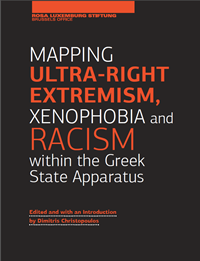 Mapping ultra-Right extremism, xenophobia and racism within the Greek state apparatus is written by five of Greece’s most serious academic and legal experts. As its title suggests, the aim of the report is to provide an explanation of why, until moves to criminalise and dismantle it were instigated in September 2013, GD was so successful in penetrating the state apparatus, particularly the police and the military. Its conclusion that GD reflects a convergence of affinities and affiliations at both the periphery and centre of Greek society is one that needs to be absorbed by all those studying and challenging fascism in other European contexts. Divided into five chapters and running to nearly 100 pages, Mapping ultra-Right extremism is more like a book than a report. It draws on the deep knowledge of its authors and provides a history of the relationship between GD and the police, judiciary, military and church. At first glance, it might seem odd to include a chapter on the Orthodox Church of Greece. But the Greek Constitution states that ‘the prevailing religion in Greece is that of the Eastern Orthodox Church of Christ’, and priests are public servants paid by the government. This in itself makes the Orthodox Church worthy of consideration as part of the state apparatus. But historically, the Orthodox Church co-operated with fascism and dictatorship and never underwent a political cleansing during the transition to democracy. Today, its anti-Communist ideology, its deep hatred of Islam, its crusading anti-homosexual stance, has led it to bolster neo-nazism by ‘disguising’ its ideology as ‘religiously right’. After the murder of the anti-fascist Pavlos Fyssas on 17 September 2013, the New Democracy/Pasok government moved swiftly to dismantle GD. 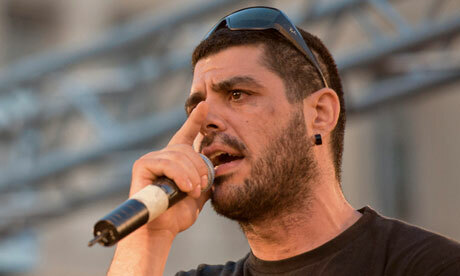 The myth took hold that the Greek state acted out of disgust at the young left-wing musician’s death. But the authors are sceptical, as the criminal activities of GD – including the murder of at least one Pakistani migrant – were well known prior to this. Could it be that the government moved to save itself? The chapter on the military by Dimosthenis Papadatos-Anagnostopoulos gives us pause to doubt the government’s self-serving narrative. The day before the murder of Pavlos, the Special Forces Reserve Officers Community announced online its intent to stage a coup d’état on 28 September 2013. It was on that day that the leader of GD, Nikos Michaloliakos MP, and four of its MPs were arrested, and investigations started into claims that key military camps had been used as training sites for GD, with the army’s connivance. Up until this point, the official line was that there were only ‘droplets’ of support for GD in the military and police. Suddenly the Minister of Public Order and Citizen Protection, who had previously threatened to sue the Guardian when it raised accusations of official tolerance of GD and the police torture of anti-fascists, was leading the hunt for the Nazi murderers. Dimitris Christopoulos, who also edited the report, has done a great job in documenting GD’s infiltration of the police, unearthing the wider undemocratic trends in policing behind the current known facts. Christopoulos shows how the authoritarian mentality of the police and their engagement in methods of covert policing and practices such as torture, associated with the two dictatorships, have now resurfaced in response to immigration. For the Border Guard and the Special Guard, recently created, poorly educated and badly trained units whose numbers and powers are constantly growing, immigrants replaced Communists as the greatest threat facing the nation. And another new corps was created, in central Athens: the infamous DELTA squad, made up of police officers who had served in the army special force. Initially formed to crack down on attacks on property by anarchists, it soon gained a reputation for acting with ‘excessive cruelty’ towards left-wing demonstrators, and for attacking migrants. And it was in this ‘poorly educated squad that the ultra-right snake found a suitable environment to lay its eggs’. Racial violence is given a more thorough treatment in the chapter by Clio Papapantoleon which focuses on the failures of the judiciary. A number of outrageous judicial decisions are charted, starting with the decision to acquit GD MP Elias Kasidiaris of charges arising from his assaulting and punching two female MPs during a live television show. Judges declared his innocence on the legally water-tight ground that ‘both the defendant and his organisation condemn violence’. The chapter contrasts the courts’ upholding of the blasphemy laws against artists with its failure to use incitement provisions against a number of GD MPs. Over several weeks in 2012, the police and prosecution service looked the other way while the Chytirio Theatre in Athens came under siege from rioting ‘religious citizens’, clergymen and GD members who threatened to kill actors performing in the play Corpus Christi, finally beating them up and causing substantial damage to the theatre. In the end, the Athens prosecutor did take decisive action – prosecuting the actors and producers of the play (including the director, choreographer and lightning technicians) for malicious blasphemy and defamation of religion! (Seemingly as an afterthought, one GD MP was singled out for prosecution.) Case after case shows bias within the judiciary, with a lenient approach to GD crimes. One reads this chapter on the judiciary in a mood of angry disbelief. As the authors rightly state, an ethnocentric approach to the law in Greece is reproducing the culture of the ultra-Right and establishing it as the normative horizon (i.e. the common view of what is just) of the Greek political community. For the authors, ‘the Greek ultra-right symptom is nothing but an extreme version of the European symptom’. The burning question they ask, was ‘the impunity granted to Nazi violence a product of tolerance due to affiliation or of distance due to fear’, is one that they have attempted to answer through deep study of the wider political culture. In the UK context we need to learn from the report’s methodology. For instance, we could take a long hard look at the Crown Prosecution Service to see what role it has played in the growth of the EDL. Those who believe that the situation in the UK has nothing in common with Greece should ask themselves this question: Why is it that Tommy Robinson is currently languishing in Woodhill Prison, not for systematic acts of incitement and intimidation of Muslim neighbourhoods across the UK over a span of six years, but for a £160,000 mortgage fraud?